I've heard quite a bit about Jill Shalvis and her Lucky Harbor series from others but never managed to read any of her books till now. Thanks to Netgalley and the publishers there for giving me a copy of my first Jill Shalvis book. Romance always makes my heart flutter. *sigh* Head Over Heels did just that. Chloe's someone I could relate to. She's a feisty and free spirited woman who hasn't had the best luck in her love life - that's mostly because she always picks the wrong guys. One day she gets a visit from Sawyer, the unfriendly local sheriff, for a cup of coffee and she feels an instant attraction but pushes it away assuming that they weren't right for each other. I don't know where to begin. Chloe is a character I really liked from the start and could even relate to. She's got asthma but instead of letting it get to her, she's always making jokes about it - even in relation to her love life by trying to decide if the guy is 'inhaler-worthy'. Ha ha. Chloe and Sawyer were perfect for each other. They balance each other out. Like I said, there were moments when my heart fluttered while reading this book. Sawyer's so so different from Chloe. He's got his ways and he sticks to them. He's not very impulsive or flexible and yet, Chloe and him match like two pieces of a jig-saw puzzle. For someone who thinks he's incapable of love, he sure does fall head over heels for Chloe. “I’d be worth the inhaler,” he said, then forced himself to walk away into the night. I'm a sucker for good lines and I've found a treasure trove of quotes that I love in Head Over Heels. This alone is enough for me to add Jill Shalvis to my 'favorite-authors' list. 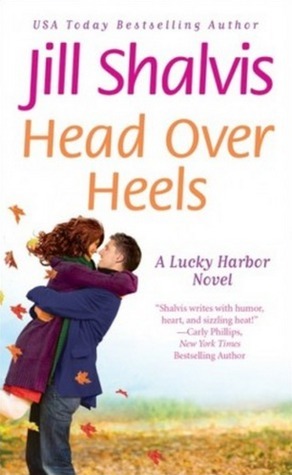 I'm so excited that this is my first Lucky Harbor book and I have more of Jill Shalvis to last till May, when her next book releases! ooh! I am definitely adding this to my TBR list! I've been wanting to read this one for a long time, I definitely have to pick this one up. Thank you for the review. whoa..nice review ..i want this book...you make me cant wait to reading this book...putting it on my TBR list..